I made the sweater above from four different sweaters the day before coming to TEDActive, each with its own history and different owner (I found them all at a thrift store). 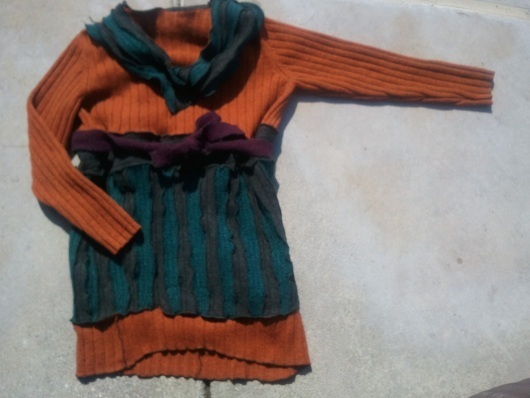 Through washing, drying, slicing and piecing them together, they became this orange,blue, gray and purple tunic, an eclectic, one-of-a-kind garment that can’t be bought or mass-produced. I had a basic pattern in mind that I had to chuck out the window when I actually sat down to work with the materials. When I think about education, and what Bing hopes to do here at TEDActive with our education workshop, the sweater reminds me of a few things … there will be a diversity of ideas, a patchwork if you will, that must be presented and unified or we will never gain momentum to solve education’s problems. We may be reworking old ideas, much as elements of the older sweaters had strong value, but we may also be working toward a completely unexpected, ad hoc notion (the new “upcycled” sweater”) that can’t be figured out ahead of time. Some of the upcycled sweater’s stitching was automated (serger machine), some had to be fudged and reinforced by hand — and that may be true for the educational system too. Technology is a powerful classroom tool, but there’s also no subsitute for the guiding hand of a great teacher. Machines and humans are both key to learning in our modern age. Also, my hodgepodge wool creation reminds me that a society with a good education system (whatever that system may evolve to be) like an upcycled sweater is a protection – against the chilly desert night, against getting too set in my ways (wool is a STRETCHY thing), against an unthinking lack of resourcefulness. If this orange sweater falls apart, I can stitch a new one with what I learned from making this one. Experience matters, trying matters, and innovating matters if we want to make a future different from what we have today. And it feels so much better if you have a hand in making that future, yourself. I look forward to seeing what the great brains at the education workshop produce over the next few days, and to the future we will all make together. Live it vivid! Previous PostThere is no magic key just lots of hints.Next PostWhere to start with a classroom revolution?